A simple and easy way to add custom Google Fonts to any WordPress theme without coding. Here are the features that make Ultimate Fonts the most powerful and user-friendly WordPress custom font plugin in the market. Get access to the largest free font collection on the Internet with Google Fonts. More to come! 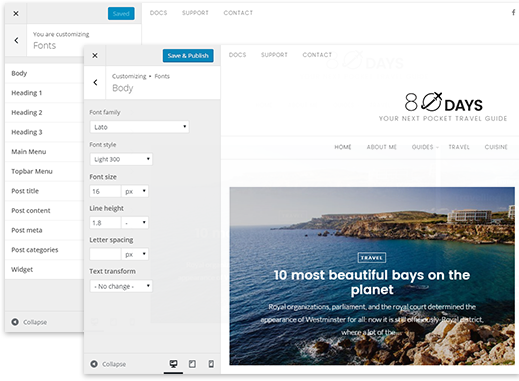 Smooth integration with WordPress Customizer to give you preview the changes in real-time. The plugin is well coded and optimized for the best website loading speed. Enjoy the beautiful look and high SEO score! Made for users, Ultimate Fonts works with any theme. No conflicts, no extra setup. Just install and enjoy! The plugin is easy to use and easy to integrate into themes if theme authors want to have font options for their users. We constantly update the plugin with more features and improvements. Use it now and feel the awesomeness!